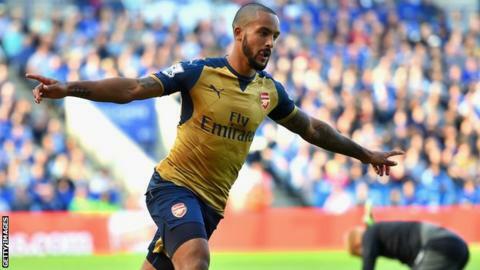 Barcelona are set to make Arsenal's England forward Theo Walcott, 26, their first signing when the club's transfer embargo is lifted in January, claims Spanish newspaper Mundo Deportivo. La Liga champions Barca are short of options in the wide positions because of an injury to Rafinha and the sale of Pedro to Chelsea at the start of the season. Real Madrid are weighing up a surprise move for Manchester United winger Memphis Depay as they look for a long-term replacement for Cristiano Ronaldo, according to Metro. Netherlands international Depay, 21, only signed for United in June in a £31m switch from PSV Eindhoven. Meanwhile, Ronaldo himself has fuelled speculation - and raised the hopes of Manchester United fans - by saying he does not know where his future lies. The Daily Mirror reports the Portugal international as saying: "I must choose the way that makes me happy." Italian website Gazzetta World claims Chelsea are interested in hiring Italy coach Antonio Conte or Inter boss Roberto Mancini as their next manager should they decide to sack Jose Mourinho. With Bayern Munich not in action at the weekend, coach Pep Guardiola flew to Barcelona to to visit Johan Cruyff, who is suffering from lung cancer, reports the West Australian. Guardiola played under Cruyff at the Spanish club in the 1990s and has described the Duitchman as his mentor. Meanwhile, Guardiola - says the Daily Mirror - is set to sign a new two-year-contract at Bayern, turning his back on a potential move to the Premier League. The Daily Mail reports that Angel di Maria, who joined Paris St-Germain from Manchester United for £44m in the summer, has hit back at criticism from the French media by saying: "People have to understand that I am not PSG's saviour and nor can I make the team win the Champions League on my own."